I was invited to attend the event as media. As always all opinions are honest and solely mine. It’s beginning to look a lot like the holidays which means most people are beginning to start their holiday shopping. Unless of course you’re like me and you are almost done with your shopping. Or at least you think you’re done until you learn about some of the hottest toys coming out this season. Oh, is that just me again? I just knew that this would be the year that I’m done with my shopping by October. Then I headed to Toy Insider’s Holiday of Play and I felt like I needed to start all over again! 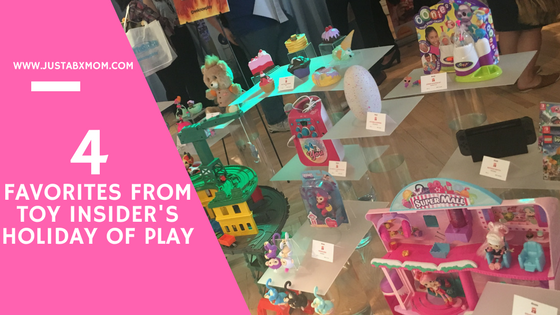 I don’t want you to feel the same so I want to share my top four toys from the event so you can add them to your list now! And don’t worry, you will learn more about some of these in upcoming posts. Luvabella Doll From SpinMaster – This is going to be the most requested doll of the season I believe. She is amazing. I actually want my own but will have to settle on playing with JustaBXgirl’s here and there. This doll is completely interactive and like a real baby learns from you. Luveabella is full of love and your little will love finding this under the tree. Oh, and did I mention there’s a Luvabeau version too in case you wanted a baby boy? Fingerlings From Wowwee – Another interactive toy. I just can’t help myself. Haven’t you ever wanted a pet monkey? Well, now you can have one that lives on your finger! They make the sweetest sounds and can fall asleep on you after playing. And they have little playsets that they can hang and swing off of for even more fun. Shopkins Shoppies Super Mall From Moose Toys – I am trying to keep JustaBXgirl from seeing this for as long as I can because I just know it is going to be sold out EVERYWHERE. We love all things Shopkins and this Shopkins Mall will be no exception to that rule. Now, if I can just find a place for it in our apartment. This is a wonderful addition to the Shoppies World and looks like such a fun place to hang out. Kurio Snap From KD Interactive – Remember how I talked about kids playing YouTube? This is the perfect product for them. They can take images and photos on here. They can even edit them and use filters. It allows them to not fill up your phone with videos and photos without stifling their creativity! If you’re still looking for list items don’t you worry. Tis the season for toy shopping…fa la la la la. I got you covered. Tomorrow, I’m hoping to get you JustaBXgirl’s top list from another recent event. And then I will be getting ready to offer my opinions on a few different types of gift guides. Stick with me, mamas and papas. I know a few little girls who are going to have the Shopkins Mall on their Christmas list this year. Oh yea! I’m sure it will be sold out very quickly. WOW! Kurio has come a long way in a short amount of time. It was so different when Elijah was JustaBXGirl’s age! Thanks JustaBXMOM! I have a better idea of what to get the little darlings on the list! Yes, they offer so many options now. And they’re coming out with a Unicorn one!!! Right? I want to make my own list for Santa! The Kurio Snap From KD Interactive looks amazing! The 9th Annual New York Baby Show Is Back… And You Get To Come Too!